A “portrait” of me, drawn by Jessica M.
I love hearing from students after they have taken a course or two from me and then gone on to pursue their goals. I enjoy each report and am thrilled that my courses meant so much to them. I do have to admit, however, that I enjoy some reports more than others. Some students credit me for their love of science, and that means the world to me! Others suggest that they couldn’t have been successful in pursuit of their goals without my courses. I tend to doubt that, but I appreciate the sentiment. Some students say that my courses have helped them in their spiritual life, and that means the most. There are times, however, that I get a report that is both meaningful and downright hilarious, at least to me! Such was the case a few days ago, when I got an email from Jessica M.
As a homeschooler, you were one of my first “favorite professors” (next to my parents and Andrew Pudewa). 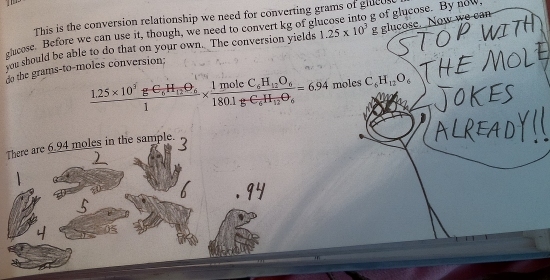 Extrapolating from your often-humorous, lighthearted writing style, I invented a jovial stickman-character of you who often appeared in the margins of my books to make comments (together with the three Chemistry Nerds and Mr. Mole). If you have ever experienced a class with Andrew Pudewa, you would know that it is no insult to finish behind him in a student’s “favorite professors” list, but that’s not what really intrigued me. I wanted to learn more about this “jovial stickman-character,” so I asked her if she would mind sending me some examples, and when she did, I spent the next several minutes laughing out loud! While I doubt that anyone finds these as funny as I do, I suspect that other students who have suffered through my chemistry and physics courses (both in high school and at the university level) will appreciate them! NOTE: I asked for and received Jessica’s permission to use her drawings in this post. I also offered to send her the post prior to publication, but she said that wasn’t necessary. I hope she enjoys it! The drawings are funny, at least to me. I always enjoy reading your posts, especially about former students. I have a question about your science curriculum so I hope it’s okay to ask it here. I might be getting my first students for a private cottage school that I am opening in the fall. One of them will be going into 7th grade and the other into 6th. They will be coming from public school. Is there a recommended approach to get them up to speed in science for the grade each will be in? Do I start at the beginning with the elementary series, or skip the earlier texts and go right to the books for their grade level? I am happy to answer your questions here. I think the best approach would probably be to start them out with Science in the Beginning, but try to do a lesson each day instead of every other day, as suggested by the book. That way, they can complete the book in one-half of a year. You can skip the challenge lessons at first and decide later whether or not to go back and do them. Have them do the “oldest student” review exercises, study for each test (there is one for every six lessons), and take each test. Since the book covers the days of creation in Genesis, it covers a little bit of everything when it comes to science. If one or both of them complete it and do well on the tests, have them start with the general science course. If one or both of them struggle or are adequately challenged by the level of Science in the Beginning, have them do Science in the Ancient World in the same way they did Science in the Beginning. Thank you for the response, Dr. Wile! I appreciate the help and am looking forward to teaching again. 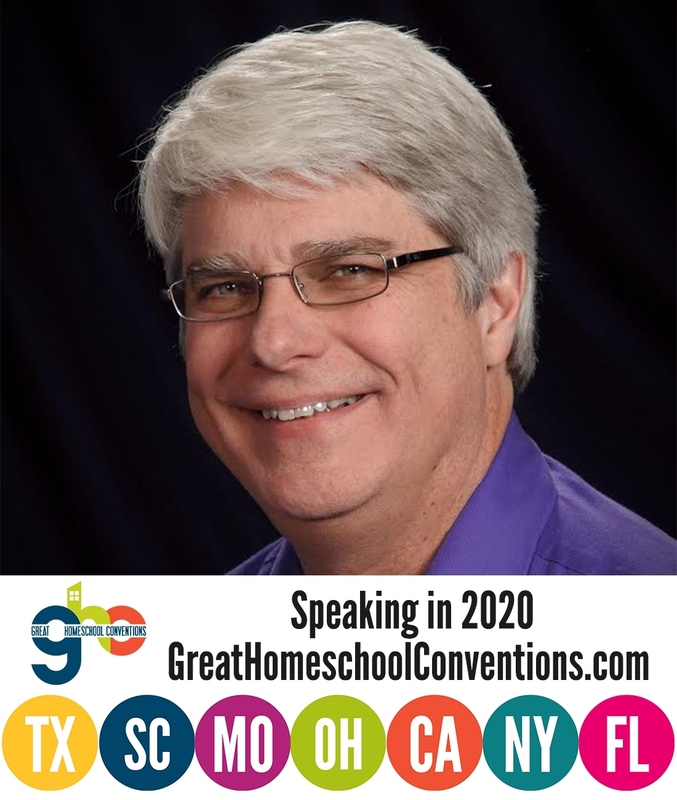 By the way, will you be attending the Florida homeschool conference this year? I was not invited this year, Cynthia. I would love to go, because it is an excellent conference. However, I haven’t been invited for several years now. I don’t comment on your blog very often but I check frequently for new posts and I always enjoy them. I have some science background ( mostly in the biological sciences but I’ve had a smattering of chemistry, physics, and calculus) and I always enjoy your science posts as well as the testimonies from athetists who became Christians. I also enjoy your homeschool posts. We have homeschooled all four of our children and now have one nurse, one cybersecurity specialist, one still in college ( currently with a 4.0) and the youngest a senior in high school. I enjoyed this post for its creativity and because we are currently working through your first edition of Apologia Chemistry. Our youngest has moderate dyslexia so I’ve been reading his science texts to him. I’ve always enjoyed your “chatty” style–like you were sitting across the table from us, explaining things. Those cute little cartoons just reinforce that impression! Anyway, I just wanted to tell you that I appreciate very much both this blog and your contribution to science education in the homeschool community. Thank you very much! I am really glad that you are finding the course (and this blog) useful. I can’t remember what I did in Biology or Chemistry, ‘cos the last time I took those subjects, not only was Maggie Thatcher the Prime Minister — she was new to the job! When I use your books, I find the old memory banks are being raided! We are using Physical Science right now, and loving it. We are on Module 2, and watched a film on Global Warming. Guess who was in the first scene? A certain Dr Jay Wile. You were great! I love the stick man — he has your winning ways. I am glad you are enjoying the course! The video was interesting to do. I thought it turned out to be pretty good. I am sad you weren’t invited to Florida. I will have to keep a lookout and see if you are speaking anywhere that I can get to easily. I have a public calendar here. It tells you where I will be speaking. I loved your textbooks sooo much! God bless you and everything you do in your life!